Attorneys representing Eastlake United for Justice delivered a letter to Oakland City Attorney Barbara Parker today warning that they are ready to sue the city to stop construction of a luxury condo tower on city-owned land near Lake Merritt. A lawsuit would surely stall the project, even if the affordable housing advocates lose. 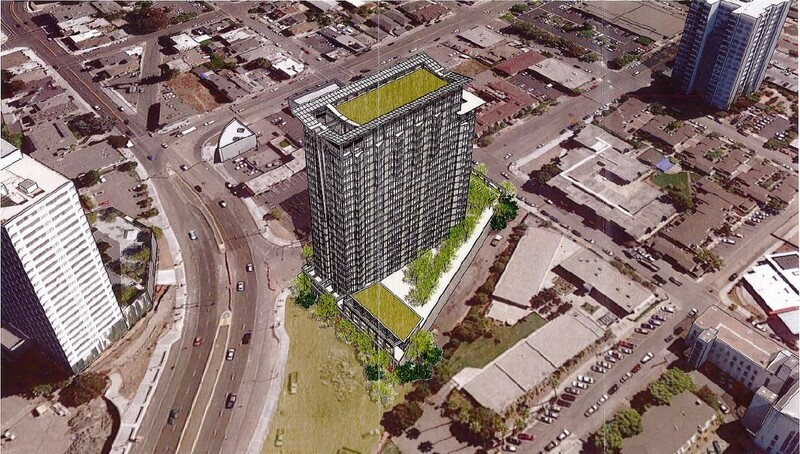 But various housing experts believe that Oakland has in fact violated the state Surplus Land Act, and city laws, in the rush to sell the E. 12th Street Remainder Parcel to UrbanCore for its proposed 298-unit luxury condo tower. Yesterday, Councilmember Abel Guillen announced a plan to incorporate thirty affordable units in the tower, and to use some of the land sale proceeds to fund affordable housing in other parts of the city. Representatives of Eastlake United for Justice praised Guillen’s efforts. But the proposal, which would make 10 percent of the building’s units affordable for individuals who earn between $52,000 and $78,000 a year, is not a true affordable housing plan, they said. The letter sent by the attorneys today adds that to comply with state and city law, at least 15 percent of the units must be made affordable to lower income households. The public interest lawyers aren't the only attorneys to weigh in on the legality of the land sale. On February 16, R. Zachary Wasserman, a well-known Oakland real estate attorney, also wrote to Parker stating his legal opinion — that the sale of the city-owned parcel to UrbanCore is legal and should not be delayed.